Though it's hard to leave Australia, let's turn our attentions to another planetary analog location: the North Island of New Zealand. This is one of the more volcanically active locations in the world, with several active stratovolcanoes (steep-sided volcanoes, like Mount Fuji or Mount St. Helens), a fairly young caldera (large volcanic depressions from super eruptions, think Yellowstone), and hydrothermal fields with colorful hot pots and geysers. My interest in volcanoes stems from my studies of Jupiter's innermost satellite, Io, which has hundreds of active volcanoes dotting its surface. On Io, we see interactions between silicate lavas, like basalts, and sulfur, a volatile that exists in abundance on the surface of Io. Sulfur in its different forms and combinations on Io creates a variety of colors, ranging from red to yellow to orange, and even green and black. We like to visit similar features on Earth so we can see these relationships up close. The active volcano White Island is located just 30 or so miles off the north coast of New Zealand. The island is privately owned, and you can access it by helicopter or small aircraft, but I opted to travel out to visit by boat last February. The tours are run by Pee Jays, an organized and knowledgeable group that helps you really make the most of your experience at the volcano. The boat approaches the volcano through a breach in the 2 km wide summit caldera, so you can actually step right inside the caldera. This is the summit caldera of a stratovolcano, a steep-sided volcano made up of basalts and andesites (slightly more silica than basalt), the rest of which is below the ocean surface. Once inside the caldera, you can walk right up into the gaping maw of the active volcano, with gushing steam vents and flowing rivers of acid water. The Pee Jays guides provided us with gas masks - a mere precaution, I thought - but I used mine probably a dozen times. At active volcanoes, there are many toxic gases emitted from the volcano, primarily CO2 and SO2 and H2S, so it's good to have along gas masks. ome of the active aspects of this volcano are evident in this picture. One of the steam vents is in the back left, and the sediment-choked stream has many recent sulfur deposits on its banks. Some of the many volcanic features we observed inside the caldera were "bombs" of lava thrown out from a recent eruption and scattered across the terrain, rivers of acid waters flanked with sulfur deposits that precipitated out of the fluids, mounds of fragile crust that forms over steam vents and periodically collapses, and at the center, a large, milky green, acid lake. This lake had become much more full and green in just the week since one of the guides had last been out, so the system is very dynamic. 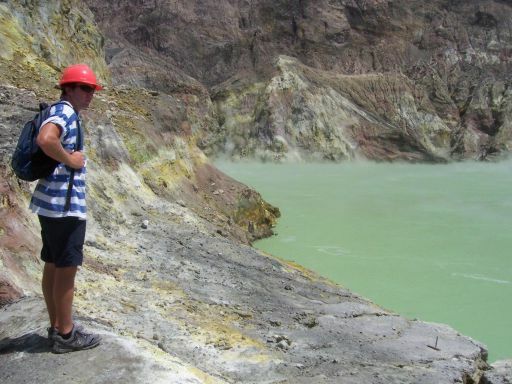 Pee Jays guide stands near the large acid lake near the caldera center. lose-up view of sulfur coating sediments flanking an acid river. 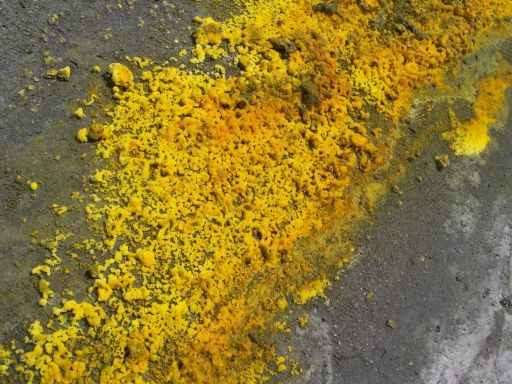 The stable, long-chain sulfur retains its bright yellow color once cooled. We see many yellow materials on Io, a result of the presence of lots of this sulfur. After visiting this active volcano, I appreciated more the importance of volatiles, in this case water and sulfur, in the shaping and changing of the landscape within the caldera. Fragile landforms are created and quickly destroyed on an ongoing basis, punctuated by more destructive eruptions of gas-charged lavas. Liquids fill and drain the main caldera floor so quickly it is hard for even the scientists to keep up. 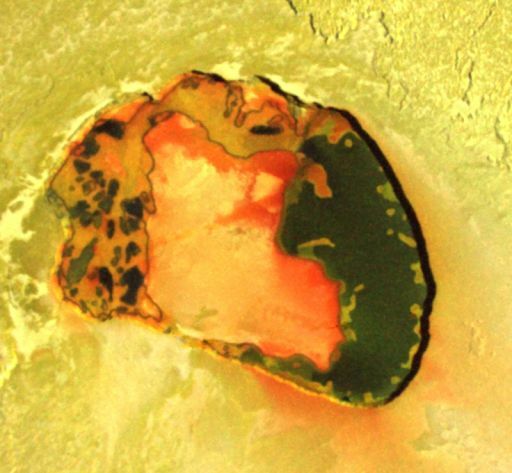 It is certain that if we could visit some active volcanoes on Io today, such as the beautiful Tupan Patera, we would see many changes in the colorful terrain on its floor since we last observed it just a few years ago. his Galileo image of Tupan Patera shows the 80 km diameter volcanic depression with mafic silicate lavas as black and sulfur fluids as reds, yellows, and green. 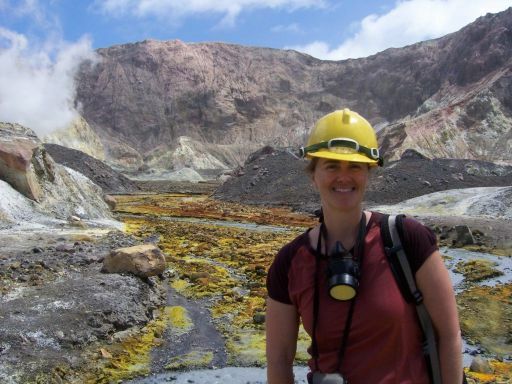 Jani Radebaugh is an Assistant Professor of Geological Sciences at Brigham Young University. Although a planetary scientist, she specializes in the study of three moons: Titan, Io, and Earth's Moon. She worked with the Galileo team as a graduate student, and is now a Cassini RADAR Associate Team Member. Since Earth is also a planet, she has made it a personal goal to visit as many places as possible with planetary connections. Destinations covered thus far include Iceland, Antarctica, Hawaii, and her favorite, the U.S. desert west.